Node-H GmbH, the leading supplier of small cells software technology, has won the Chairman’s Award at the annual Small Cell Industry Awards. The award is given by the Chairman of the Small Cell Forum to recognize a significant contribution to the small cell industry. 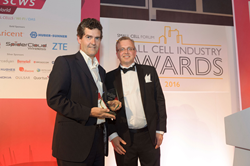 Dr. Alan Law of Vodafone, the Chairman, announced the award at the Small Cell Industry Awards dinner during the Small Cells World Summit in London on the 11th of May. Node-H GmbH is a pure-play small cells software company covering UMTS, LTE and dual-mode small cells technologies for residential, enterprise and public small cells. The company’s portable software runs to the maximum platform capability on the leading chipset platforms. The high-performance, fully integrated software was designed for cost-optimized SoC small cells platforms to help device manufacturers achieve fast time-to-market with a high-quality solution. Node-H is a member of the Small Cells Forum. Node-H is privately funded and based in Munich, Germany. For more information about Node-H, please visit http://www.node-h.com.